This article is about the Pirate Heartless. You may be looking for Barbossa's cursed crew. Heartless that mostly appear in Neverland. They are quite combative with their swords. They often just focus on the enemies in front, making them vulnerable to attacks from behind. A Heartless that mostly sticks to Neverland. A skilled swordsman, the Pirate can knock its enemies out cold and then finish them off with a vicious combo. If its sword flashes, watch out! Changes the value of all cards to 0. The Pirate (パイレーツ, Pairētsu?) is an Emblem Heartless found in Kingdom Hearts and Kingdom Hearts Chain of Memories. The Heartless Pirate is made to fit in with the crew members aboard Captain Hook's ship at first glance, though their costumes don't quite succeed in covering the traditional Heartless dark skin and toothy jaw. Bare-chested on their bellies and wearing black turtleneck shirts that are stitched into their chests, covering their upper torsos, save for the Heartless Emblem in between, Pirates are clad in brown and tan-patched pants and matching shoes, a red sash, bright yellow wristbands, and skull-shaped shoulder armor. They wear bright red bandannas on their heads that cover their eyes; in place of one eye is a black eyepatch with a white cross on it, while in place of the other is an angular black spiral. When Pirates attack, their sword becomes the most noticeable part of them. Their weapons boast a wide, curved blade, similar to a Chinese dao; halfway down, the blade is etched with a bright red crack and a yellow angled spiral mirroring the one on the Pirate's bandanna, which make it look like it features a frowning face. There is no hilt, though the blade is held to the handle by a heavy duty clip. The sword's grip is covered in the same bright red fabric as the sash and bandanna. The Pirate's name is a reference to its stereotypical pirate-like appearance. Pirates were outlaws who sailed the seas, robbing and murdering passing sailors. This Heartless rears back before launching its attack, giving Sora plenty of warning. If the attack is avoided, the Pirate will stumble, leaving itself open to a counterattack. If the attack is blocked or deflected, the Pirate will fall over, leaving it open to attack for a longer period of time. If Sora blocks its most powerful slash, he will receive 24 Tech Points. 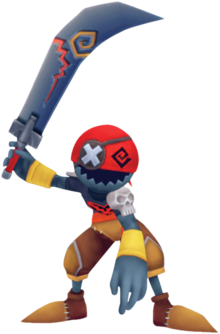 The Pirates are the only Emblem Heartless to not receive a palette swap in Kingdom Hearts Final Mix. This page was last edited on 3 April 2019, at 18:25.